Ashwagandha has a long history of use in Ayurveda, the traditional medicine system of India, for a wide variety of conditions. It is considered an adaptogen, or a substance that strengthens the body against stress, promoting energy and overall wellness. The Memorial Sloan-Kettering Cancer Center notes studies have demonstrated anticancer properties as well. Like pharmaceutical drugs, herbs such as ashwagandha contain substances that exert certain effects on the body, making them inappropriate if you have certain medical conditions or take certain types of medications. As of 2010, not enough information exists on the possible effects of using ashwagandha long-term, but it appears to be generally safe and non-toxic. If you have an interest in using herbal medicine, consult with a health care professional experienced in this arena. The MSKCC notes that ashwagandha has aborofacient properties, and can induce abortion in pregnant women. You should avoid this herb if you are pregnant or nursing. This appears to represent the only female-specific side effect of this herb. Physician and alternative medicine expert Dr. Ray Sahelian and the MSKCC both note a case where a woman taking ashwagandha for chronic fatigue developed thyrotoxicosis, a condition that causes the thyroid gland to produce too much thyroid hormone. The condition resolved itself once she stopped using the supplement. The literature did not note dosage or how long she had been taking it. Ashwagandha contains chemicals that appear to exert tranquilizer-like effects. 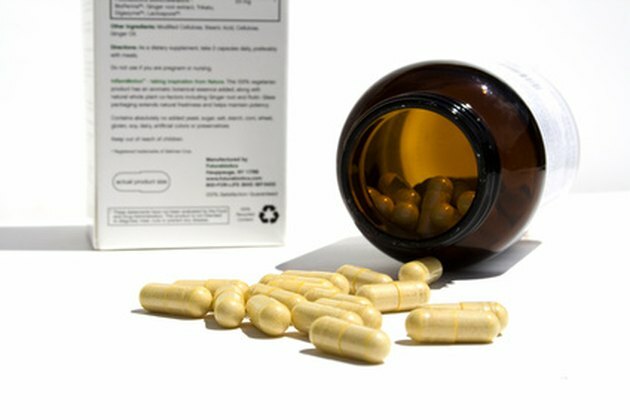 MSKCC and Drugs.com, a website that synthesizes information from Physician’s Desk Reference and other official medical texts, note that taking this herb with barbiturates might increase their sedative effects. Drugs.com explains that it might also interact with digoxin, a common treatment for the symptoms of congestive heart failure.